The simple process for how to clean aluminum can help you make your home shine. Aluminum is one of the most abundant metals on Earth and the one used to make the majority of household items such as pots, pans and tables. How to clean aluminum, therefore, is a question that almost everyone will need answered at some point. Aluminum is a very soft and light metal that resists corrosion. To make it stronger, it is usually anodized or mixed with other metals such as magnesium or copper. Anodizing is a chemical process where the top layer of a metal is treated to make it thicker, thereby also making it stronger. Even though naturally anti-corrosive, aluminum responds to oxygen exposure by developing a coating on its surface. Cleaning aluminum will remove this coating to restore the metal's shine. The first step in cleaning aluminum is to rid the item of any dust and debris by washing or wiping it down. You can use a fine grade steel wool or pad to scrub away food or other dirt stuck to the object's surface. 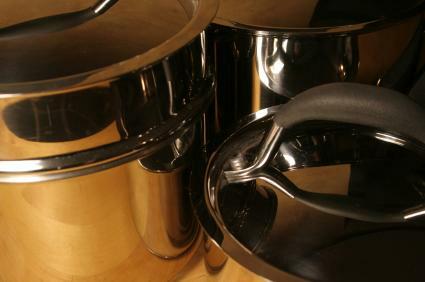 Stuck foods or other items may rub against and scratch the aluminum surface during cleaning. Do not scrub vigorously or use an abrasive pad as you may scratch the item. Next, determine if the aluminum is unfinished. An aluminum object covered in lacquer, paint or another coating should be cleaned according to the requirements of the coating rather than the metal. To thoroughly clean the item you will need an acid-based solution. Acids remove the oxidized coating that naturally develops on aluminum surfaces. While you can use acids such as bleach or hydrofluoric acid, they have many negative side effects and do not do a better job than the acids found in your home. The natural acids found in tomatoes, lemons or even apples clean aluminum just as well as harsh chemicals, without the toxicity. This means that you can clean aluminum pots and pans simply by cooking something acidic in them. So go ahead, make that lemon chicken or spaghetti sauce! For particularly tough stains, however, you may need to use more acid than what is found in a common recipe. In this situation, doubling or even tripling the amount of acids will do the job, but probably won't make for a tasty meal. Alternatively, you can use a homemade cleaning solution to clean your pots and pans. Add two tablespoons of white vinegar or lemon juice to a quart of water. Bring the water to a boil and let it boil for 15 minutes. You may need to repeat this process several times to remove all dirt. This method will clean not only the pot but anything you put in the pot, making it an easy way to clean small aluminum objects. Acid solutions are also usable for cleaning aluminum surfaces, such as stove tops or tables. Saturate a cloth into the juice of one lemon, and rub the surface with quick, circular strokes. You may have to repeat this process or use juice from an additional lemon for more stubborn stains. For tough stains you can add a little salt to the mixture or slice a lemon in half, sprinkle it with salt and rub the lemon half directly on the aluminum. The extra abrasion in the salt helps with breaking up hardened stains or dirt while the acid from the lemon will help restore the aluminum's shine. Limes can substitute for lemons. Because aluminum reacts naturally to oxygen exposure, you might want to give your non-cooking aluminum items a protective coating to impede its development of an oxide coating. To do so, apply a thin coating of olive or lemon oil to the item's surface with a soft rag. The oil will act as a barrier. Cleaning your aluminum items can be almost effortless. By using everyday items, you can make your aluminum pots, pans and other items shine like they did when they were brand new. The fact that cleaning aluminum, and pots and pans in particular, requires very little elbow grease means that you'll still have energy to cook your delicious spaghetti or apple sauce.